According to some dude on the internet, the "Original Recipe" is not packaged in three different places. It is the way it is cooked and the process makes it taste like it has eleven herbs and spices when in reality there is not. While some may argue and insist and object this point of view, here are the 11 spices which are a mere guess listed below. Note: The real spices and herbs are not publically known, unless you yourself work in KFC food processing department. But we are not using those 11 spices for this recipe here. The way it is done in the restaurant is using dried eggs and milk in the flour along with a box of breading salt and the seasoning bag and a bag of breading flour. Place shortening into the pressure cooker and heat over medium heat to the shortening reaches 400°F. In a small bowl, combine the egg and milk. In a separate bowl, combine the remaining six dry ingredients. Dip each piece of chicken into the milk until fully moistened. Roll the moistened chicken in the flour mixture until well coated. In groups of four or five, drop the covered chicken pieces into the shortening and lock the lid. the basil is supposed to be thyme,the dill is supposed to be sage,no cloves but tomato powder, not instant soup. this is my old recipe which is old but updated, now, no egg and milk wash either. 9 pieces , not eight love that keel. 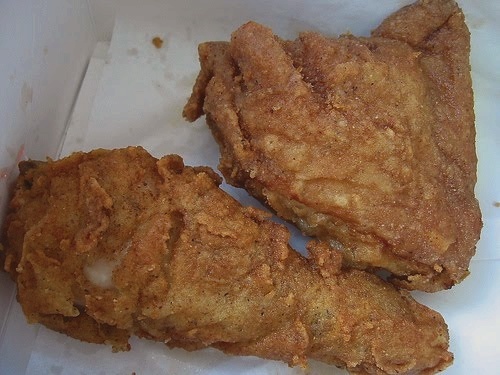 that oil is way to hot, ive never deep fryed chicken at 400 , i know it would be well done out side and raw inside, 325 to 340 if frying 4 or 5 pieces in a med size home fryer. this is bs , dont pressure fry at 400, thats CRAZY, 350 , put in chicken and seal lid , when pressure moves rocker lower temp to 280 and pressure fry . 10 min allow 1 min for pressure ease off so lid can come off saftly.now when lid is off , careful if you pressure cooked correctly the oil will be rolling , this is cool, just get a deep fry scoop a get chicken, the oil will stop rolling when scoop touchs it. just rinse chicken in water and then put in flour. the egg powder adhears and increses chicken flavour. Hi, thanks for your input. Interesting. Thanks for sharing!